I recently stumbled across a website that purports to represent a center-right point-of-view called The American Conservative. Initially intrigued -- considering that Americans can always use compelling conservative opinion sites -- I perused the site and quickly noticed something a bit, well, off. No fewer than five articles on the front page alone represented attacks on Sen. Ted Cruz -- the brilliant Constitutional conservative from Texas -- and many more attacked Israel and "Islamophobia". The ludicrous crackpot Stephen M. Walt, a notorious purveyor of anti-semitism, is linked as are pseudo-conservatives like Conor Friedersdorf. in short, I smelled a rat. Using whois, I quickly determined that the domain was owned by one Daniel McCarthy and the offices of the publication are listed as 1710 Rhode Island Ave. NW, Suite 1200 in Washington, DC. You'll never guess what other magazine has its headquarters in the same office? That's right: the far left, radical Marxists at The American Prospect, a veritable cornucopia of crypto-Communism. 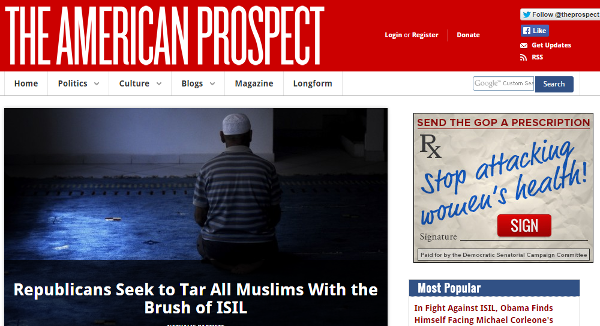 The American Prospect is a bimonthly American political magazine dedicated to American liberalism. Based in Washington, DC, The American Prospect is a journal 'of liberal ideas, committed to a just society, an enriched democracy, and effective liberal politics' which focuses on United States politics and public policy. Politically, the magazine is in support of modern American liberalism, similar to The New Republic and The Nation. TAP's writers include the world's dumbest blogger -- Matty Yglesias -- as well as the world's dumbest publisher, Ezra Klein. Put simply, TAC and TAP share an office and an ideology: a rabid hatred of the Constitution as well as America's history, traditions, culture and mores. So when you accidentally step on Internet chewing gum like TAC, know you are viewing an apparent false-flag operation that operates like a honeypot. I haven't provided any links, because this kind of lint isn't even worth the 0.0000000001 calories it would take to click on a link. Visit BadBlue News instead for real, uncensored news. The domains are parked with a domain company - probably hundreds more domains share that address. TAC is a paleoconservative site and I'm amazed you are just now aware of it. But relax - no publication that features Pat Buchanan and Taki as board members is a liberal rag. if Pat Buchanan is on the board, it's a rag. Rick, that's incorrect. Here's the WHOIS record for TAC. Sounds like a RINO/CINO site...which like CPAC has gotten off track and is no longer conservative. Maybe, just maybe, TAC is a largely paleoconservative publication with policy views you dislike, rather than part of an elaborate conspiracy with the liberal media to hide its true agenda. Which of those alternatives seems more likely? Occham's Razor and all that. I just got an email from Karl Rove! Who Forced Eric Holder Out? GIRD YOUR LOINS: Are You Ready for Hillary? Larwyn's Linx: Where have all the allies gone? STOCK MARKET CRASH DEAD AHEAD! Or not. Government Anti-WMD Teams on the Move?